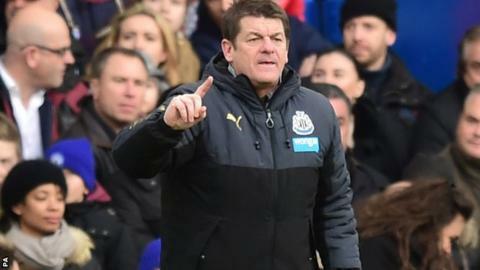 Newcastle United caretaker manager John Carver is "almost certain" the club will have a new boss in place by the end of January. Carver has put himself forward for the vacancy left by Alan Pardew's departure to Crystal Palace. But the club's hierarchy is speaking to several candidates, including former Lyon boss Remi Garde. "We are quite a way down the line," said Carver, "They are doing it properly and thoroughly." Owner Mike Ashley, managing director Lee Charnley and chief scout Graham Carr will continue the search for a new manager following Saturday's game with Southampton, after which the team has a break until 31 January, when they play Hull. Carver said: "By the time we play Hull it will be almost a month and I'm almost certain it should be resolved by then." Since Pardew left and then took over at Selhurst Park on 3 January, Frank de Boer, Christophe Galtier, Paul Clement and Steve McClaren have distanced themselves from the position. Carver added: "The club has a process and you can appreciate this is a massive football club, so they have to do their due diligence on everybody. "There's a process and I am involved in that. When the time is right, they will announce the new head coach."